My favorite cycling races of the year are upon us. I will admit I like these races because all the action and glory happens in one day. And because I like to see who has their game on, who is in form early-season, although these races can be seen as the season for many of us. I also like the scenery - I admit it. The Landscape of the Italian races or the tradition of the cobbles - these races are the best. Ah spring is in the air. I just wish more people would discover the world beyond the Grand Tours (Giro, Tour de France, Vuelta). Milan-San Remo (Italy) – La Classicissima, Milano-Sanremo opens the Classics season every year. It is called La Primavera (Italian for the spring), the race was first run in 1907. It should be called "Il Longets" (The Longest) because it certainly is at 298 kilometers long. Gent–Wevelgem (Belgium) - the first 'Spring Classic' in the season, began in 1934, the parcours include the famed Kemmelberg climb. E3 Harelbeke (Belgium) - named after the road it is raced upon, was first held in 1958, pronounced “ay-dree press harold bek” (give it another try). Ronde van Vlaanderen (Belgium) – Tour de Flandres, or Tour of Flanders in English, or Vlaanderens mooiste ("Flanders's most beautiful") started in 1913, this race is both hugely popular and prestigious in Belgium. Paris–Roubaix (France) – called La Reine ("Queen of the Classics") or l'Enfer du Nord ("Hell of the North"), or La Pascale. The race is traditionally one week after the Ronde van Vlaanderen, first raced in 1896 on Easter Sunday. P-R is all about the pavé, which is indeed massive and rutted. Amstel Gold Race (The Netherlands) – the newest race of the Classics was first run in 1966. La Flèche Wallonne (Belgium) – first run in 1936, Walloon Arrow is traditionally held in the wooded Ardennes region, mid-week between the Amstel Gold and the "Monument" Liège–Bastogne–Liège. Liège–Bastogne–Liège (Belgium) - the oldest one-day race on the calendar, begun in 1892. Another newspaper race. Spring Classics = Cobbled classics + Ardennes classics. The Spring Classics are traditionally held in late March or April in Belgium, the Netherlands, and France. There are only 2 men that have won the "Triple in the same year - Davide Rebellin in 2004 and Philippe Gilbert in 2011. Il Lombardia (Italy) – the only race considered a Monument, but not a Classic, the race is held in October. Known as the "Race of the Falling Leaves" and initially called the Milano–Milano (1905). The race was renamed to Giro di Lombardia in 1907, and then Il Lombardia in 2012. Video: The Classics on SBS (Cycling Central) 2013. 120 years of tradition! Paris-Nice begins this weekend, and although it leads out the real race season, it is not considered a true Spring Classic. It is one of those races created because two newspapers wanted to increase readership.Paris-Nice is an eight-day stage race in France and overlaps the 7-stage race Tirreno-Adriatico in Italy. In 2013, the races will compete for top-billing riders. Typically Paris-Nice has been the chosen race to prepare for the Giro d'Italia in May, but take a look at the line-up for Tirreno-Adriatico this year, I bet that race director is thrilled. 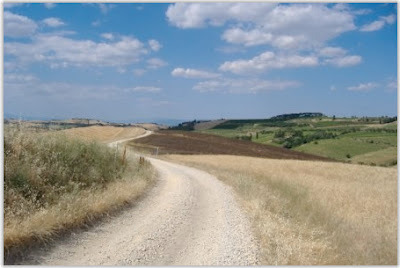 Look - its a dusty white road in Italy, where they have so many you must use the plural. bianchi - does not apply to the race other than team Vancansoleil-DCM rides Bianchi bikes. A brief history of our American racing and an interesting point made by John Wilcockson in Peloton Magazine: The U.S. Needs One-Day Classics. A topic I am interested in - the dying art of the American road race - at least road races appear to be dying here in Colorado. 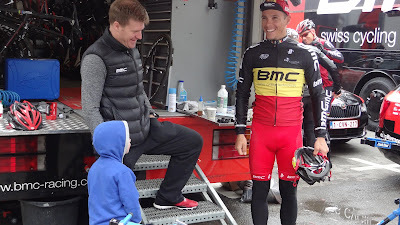 We need to look to Europe if we want the Classics and last year when I was fortunate enough to go see Tour of Flanders and Paris-Roubaix in Belgium/France, it was an all time high for me as a cycling fan and traveler. This year I will be content to watch online. Dan Wouri always seems to capture my whacky life in a tweet. This was his tweet after Kuurne-Brussels-Kuurne was recently canceled due to snow. Without #KBK my morning is lost. Is there some other badly pixelated, foreign language webstream I could watch as a Plan B? If you plan to travel to Belgium to watch the races, you'll find some good information on the SPRING CLASSICS guide page by Pedal Dancer. Including previous posts, videos of some of the famous bergs & climbs and lots of links to others who write about cycling in Belgium. Oh and the beer! (yup, I'm still on that theme). To view the UCI WorldTour calendar, please visit the CALENDAR OF RACES and EVENTS guide page by Pedal Dancer. For more race dates please go to 2012 - 2013 UCI Road Calendar, or for a very extensive map of all races please visit Recommended: Race Calendar by The Inner Ring.